Guess which cybernetically enhanced supersoldier is going to college? In a new campaign from Crispin Porter + Bogusky, Microsoft follows the latest celebrity who's headed off to college this fall. But he's not a tween singer or a movie star. In fact, he's not even human. The first spot below shows home video of a seemingly typical high school graduation, but with a surprise guest. Two smiling girls collect their diplomas to polite applause before the emcee proudly announces the school's most popular "student." And it's hulking 8-foot-tall supersoldier Spartan from the Xbox game Halo, sending the audience into a roar. 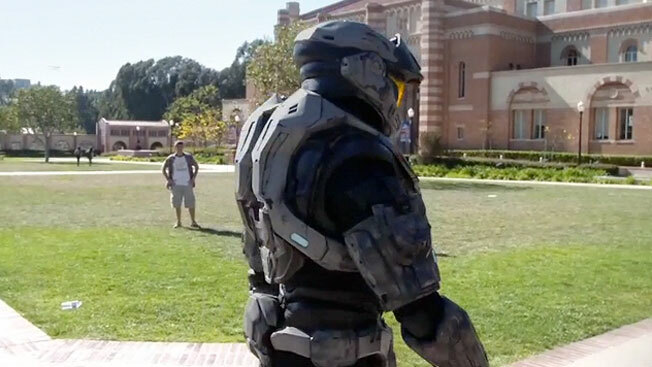 A second home video-inspired ad follows a group of kids on a college tour, joined again by Spartan. One clumsy student hits him on the head (helmet?) with a Frisbee—and being a superpowerful, alien-killing soldier, he manages to hurl it back several thousand feet, chopping off some distant foliage in the process. Needless to say, his fellow tour mates are pretty impressed. "Guess who's coming to college?" both spots ask (well, the first one says "university"—apparently it's for the Canadian market). And while Spartan may not actually be able to join you at school, Microsoft is making it possible for you to spend some quality time together by offering a free Xbox 360 with the purchase of a Windows 7 PC. It's probably safer than letting a cybernetically enhanced killer in your dorm, anyway. Spots: "Halo Graduation," "Halo Tour"
Postproduction Company: Method, Santa Monica, Calif.